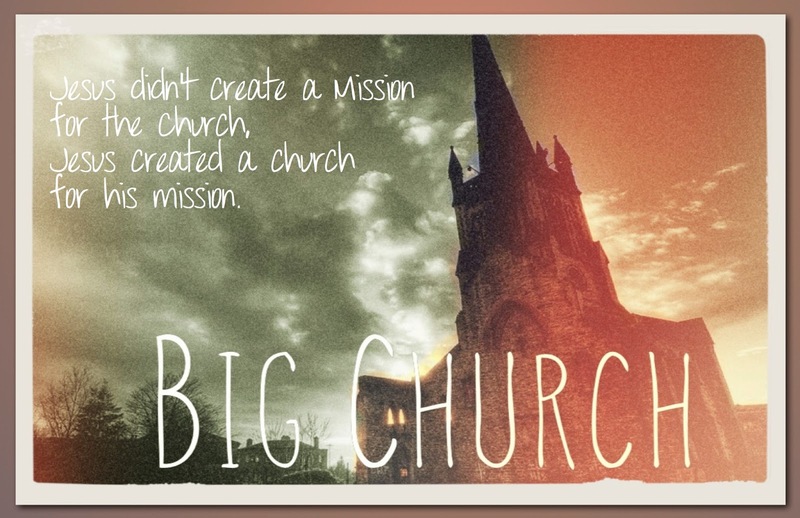 Big Church Week Six: "En Fuego"
This week I am concluding the sermon series, "Big Church," which has been both a study in the book of Acts and a vision for the way the Church should be in the world. I admit that I write that last bit with a certain amount of confidence, which might be interpreted by some as presumptuous. "Who are you," they might ask, "to determine how the Church should be in the world? What are your qualifications? What right do you have to speak for the rest of us?" I don't have the right to speak for anyone, honestly. I'm simply a pastor of a medium-sized church in a small town in the middle of Florida. It takes me forty minutes to find a Whole Foods Market, or a proper Starbucks. My platform isn't very large, and I have no national audience to speak of. But for the past several years something has been stirring in my heart, and as I read the story of the Church in Scripture I begin to catch glimpses of what makes the Church---the Church. You see, I have realized lately that the Church is not an institution---though us church-y types have certainly tried hard to make it into one---it's a movement. And this sermon series has been focused around the central notion that "Jesus did not create a mission for the Church, he created a church for his Mission." This week is Pentecost Sunday, and we are going to be focusing on the story of the Day of Pentecost from Acts 2:1-21. It's a bit of moving backward into the story in order to move forward---if that makes any sense. Here's the text in it's entirety. I won't be reading the whole thing during the sermon, but I'll include it here so you can read it on your own. Pentecost is traditionally the 50th day after Passover, and is more accurately called the Feast of Weeks or Shavuot. It was an agricultural festival that was marked with the giving of the "first fruits." In other words, the Hebrew people were asked to give the first sheaf of the wheat harvest as an offering and to pray fervently that the remainder of the harvest would be brought in plentiful. The Feast of Shavuot was also traditionally held to commemorate when Moses was given the Torah (the law) on Mt. Sinai and God entered into a covenantal relationship with the people of Israel. It was actually more well known as a festival by the Jews living in or around Jerusalem, and less well known by the Jews in the disaspora---foreign Jews from around the world. Verse one of the passage sets the tone, doesn't it? "When the day of Pentecost came..." Not really, you say? Well that's because it's not in Greek in that translation. When you put it in Greek you use the word symplermsthai, which means "was fulfilled." This is prophetic language that is loaded with possibility, dread, anticipation and trembling. They were all were gathered---those first members of the Church--huddled together in a room waiting for something to happen, praying for a sign, begging for Jesus to show them what they were being called to do and to be. And the sign came in wind and fire. Wind was a sign of the breath of God, as we will read in a bit when we take a look at Ezekiel chapter 37. Fire was a way to describe a physiological experience of prophetic inspiration and it was also a sign of the very Spirit of God. In other words, the people who were there in that room would describe what happened to them then as if they were on fire. In a rush, they were given the power not only to speak the word of God to the world, but also to think about God in fresh and inspired ways they had never thought possible. So it was a good moment. Then they go out to the Temple on the Southern or "Teaching" steps and begin to preach and teach about Jesus--only they started doing it in other languages that none of them had heretofore been able to speak. And this rather long list of foreign Jews suddenly can hear the words of the disciples in their own languages. It was so surprising and crazy that some people began to declare that the disciples may be drunk. "These men are filled with new wine..." they said, which I find a doubly interesting inclusion for the author to make. Because, after all, it was Jesus himself who once told his disciples that "you cannot put new wine into old wineskins..." when he was speaking of the way that the Pharisees were struggling to understand who he was. Then Peter gets up to speak and he preaches it up. Peter was given a second chance to declare his allegiance and loyalty to Jesus and he makes the most of it here in this passage. He stands on the Teaching Steps of the Temple, where he sat and listened to Jesus preach on numerous occasions, and shares the Gospel with the people who have gathered there en masse. Over three thousand of these Jewish pilgrims embrace the teaching and are baptized right then in there in the name of Jesus---baptized in the mikvot baths that were located by the steps. Boom. Now that's a church service. So what's really going on here? I am sure by now you know that there's probably more to the story and there most definitely is... more. But before we dive into this, I want to say this at the outset. The Movement of the Church is Part of God's Big Story of Redemption and We Are Part of That Story. What happened on Pentecost was a moment that was absolutely pregnant with imagery and possibility. I see it happening in three "prophetic moves:"
In the book of Genesis we read in the Creation poem of a God who breathes the breath of life into a lump of clay---words that helped the ancients visualize the way that God continues to breath the breath of life into each of his image-bearers. This wind is the breath of God breathing life into humankind. In the book of Ezekiel chapter 37 the prophet Ezekiel is given a vision of a valley of dry bones. He is commanded by God to speak to the bones, to preach to them and prophesy. When he does, God knits those bones together and breathes the breath of life into them. The vision speaks of the captivity of the people of Israel, but speaks even more loudly to the captivity of all people who are trapped in death and sin. This is the breath of God breathing life into dry bones of captivity. In the book of Exodus God leads the Hebrew people through the wilderness with a pillar of fire by night and pillar of smoke by day. This fire from heaven led them with power and glory out of slavery and into freedom. This is the fire that guided the Israelites by night. In the book of 1 Kings the prophet Elijah calls down fire from heaven when he is dueling with the prophets of Baal over whether Baal is to be god in Israel or whether Yahweh is to be God in Israel. This is the fire that fell from heaven on Mt. Carmel and caused the people to shout, "Yahweh He is God!" Early in the book of Genesis we find the story of the Tower of Babel, a strange tale of how humankind decided to build a tower that would reach to heaven. They were focused only on themselves and their own achievement, their own technology and they lost sight of who they really were, and who God always is. In the story, their speech is suddenly confused and they no longer understand one another. But in the story of Pentecost all of that is reversed. The story of Pentecost reveals that through the selfless example of Jesus Christ, true unity is possible. There is no tower in the story of Pentecost, only a solitary cross that stands as a sign and symbol of God's great love for Creation. In the Tower of Babel story, God says "let us go down" to see what the humans are doing. In the story of Pentecost, the God who came down is revealed as the God who became one of us in order to save all of us. And in the end, the promise that God made to Abraham is fulfilled at last---through his descendants and ultimately through the one true Israelite, the Son of Man, the Prince of Peace, Jesus himself---all of the nations of the world are blessed. On Mt. Sinai Moses was given the law, the Torah, in a moment of great power, of fire and wind and smoke. God entered in that moment into a covenant relationship with his people. He had chosen them, the least of the nations of the world. He had redeemed them from slavery, and set them apart to be a light to the world. And despite all of the ways they continually broke their end of the bargain, God loved them, rescued them, and continued to reach out to them. On Pentecost the new covenant with all of humankind was witnessed through a powerful moment of Spirit-filled witness, delivered by some fired up and pumped up witnesses to the very Resurrection of Jesus Christ. When Peter preaches the Gospel to the nations, the message of redemption, of God's victory of Death permeated the very souls of those that heard it. Once again, God showed his preference for the underdogs, for those who were far away, for the far flung places that these people would return to with a message of hope. It was a good day, my friends. A very good day. So, this leads us to the questions that those of us on this side of the historic moment of Pentecost should be asking. Are we seeking to be filled by the Spirit? Well, are we? Is our church, our community of faith bent on not only being filled by the Spirit, but being led by the Spirit. Are we truly being "first fruits?" After all, that's what the disciples essentially were in this moment. They were the first of the harvest, presented as an offering by Jesus himself, and because of their very public offering, the harvest was begun in earnest. Do we see ourselves this way? Or do we see our church as "our church," meant to fulfill our needs, and be done exactly as we would have it done? Are we proclaiming the Gospel? There's an old adage attributed to St. Francis that states, "Preach the Gospel at all times and if necessary use words." It gets a lot of mileage because most Christians like the idea of not ever really having to say anything to anyone about what they believe. Incidentally, most Christians don't really preach the Gospel with their lives, either. Are we speaking the truth as well as living it? In just a few months I will celebrate my fifth anniversary as pastor of First Presbyterian Church of Eustis. It's been an amazing five years. If you had told me then that our church would be as vibrant, growing, outward focused and excited as it is right now---I would have never believed you. It was a dream that became a reality by the power and grace of God. We determined some time ago that God was calling us to be a church that did church differently. We weren't called to be a country club. We weren't called to exist only for ourselves. We had a great history and fascinating past, but we weren't being called to live there. We knew that God was calling us to be a church full of people who "know and show Jesus." Because when you know Jesus, you want to show Jesus. It's that simple. And because of this, we worship every week by giving God everything we have in joy, reverence and passion. We pray with the kind of hope that comes from knowing that God hears and answers prayer. We seek to grow in our faith by reading, teaching and proclaiming the word of God on Sunday mornings, in classes and small groups for all ages. We love on one another and the world around us in the ways we care for each other, nurture one another and walk with one another even through the valley of the shadow of death. We serve our God and the world by acts of compassion and mercy---feeding the hungry, clothing the naked, reaching out to the lost, lonely and forgotten. This is what we do because this is who we are. We are the Church. We are not part of an institution. We are not our buildings. We are not stuck within the four walls of this sanctuary afraid to go outside because the Spirit has arrived in this place, breathed the breath of life into us, anointed us by fire and sent us out into the world to be part of the Movement of Jesus Christ. The Movement of the Church is part of God's big story of Redemption, my brothers and sisters, and we are part of that story. It's time to move. It's who you are.